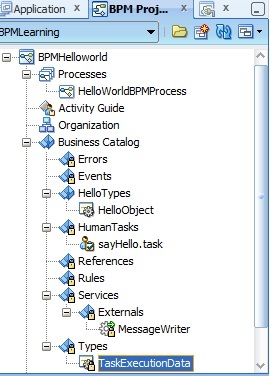 It has been some time that I got queries on how to get started on BPM .The best way to start on any technology or product stack is to do it the HelloWorld way. Always start with a hello world example. I am using 11.1.1.1.6 environment for the examples. To start up with you can just do the small part of getting the hello message /greeting and writing it to a file . In Jdev it will look like this. The Request Hello in turn is implemented using a Human work flow activity, which receives in a HelloMessage and makes a service call which in turn calls a file adapter to write to a file. Two activities between Start and End in BPM layer. The implementations of these 2 activities are done in SOA layer using Human work Flow and call to a file adapter. The JDev Role matters, In case you select the BPM Role for Jdeveloper development, the implementation tab will be missing from your activities when you drill down. So if you want to the implementation in SOA then the Role must be default which gives access to both BPM and SOA together. During your development the main tab that yo will be using is the BPMProjectNavigator which will list the different components that will be part of your process. There are some chances the auto-create Task form may run into issues. 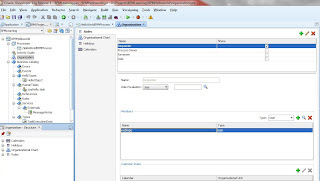 So create the Task form again and delete previous UI project associated with the BPM process. 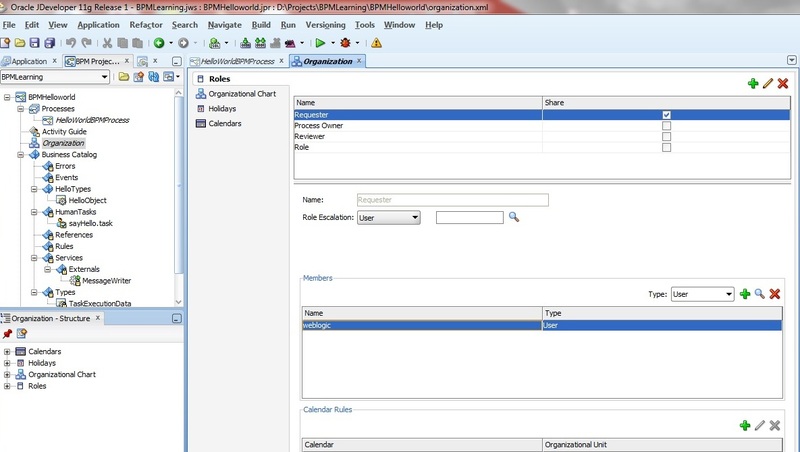 Once you compile/deploy BPM process, you will need to login to BPM workspace to view and initiate the process. The common issue is that The BPM process is not visible in th BPM workspace. The User roles become pretty important in BPM. By default the Role of the Hello world activities will be tied to Role. You can change it to Requester or other role based on your process design. These roles will now need to be mapped to users. In case the process doesn’t show up you will have to check or create /modify users for roles. The below screenshots show the configurations that need to be done on User roles in jdeveloper, EM and BPM workspace. a) Add the users to the roles used in the process/project. c) Add the <project name>.<rolename> and Users to the roles who can access the role. b) Add the user to <composite name>.<role name> members. In BPM workspace when you click on process to initiate the process for entering the Hello Message. The UI page throws an error .Page not found exception. Error: OracleJSP error: java.io.FileNotFoundException: Set the init-param debug_mode to "true" to see the complete exception message. 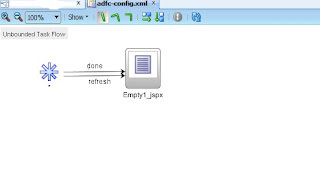 The error is because adfc-config.xml refers to Empty1.jspx file. Create a empty jspx file and name it as Empty1.jspx , add below content in the file. Once you add the file and redeploy the process the error will not recur. Then you can enter all the hello message and submit the values, which in turn will make a service call to write a message to the file as specified in file adapter.